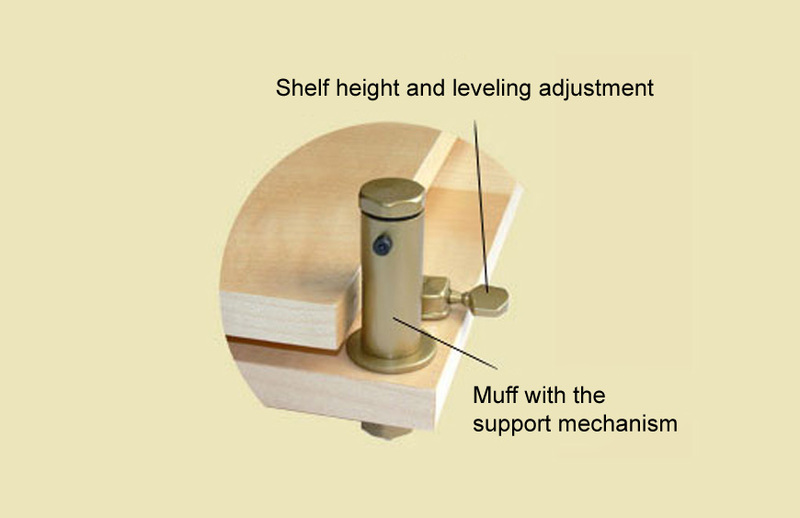 rising and levelling of the shelf using the tensioners for the strings mounted in the plinth (the shelf is risen by turning the keys clockwise, and lowered by turning them in the opposite direction). Before the electronic equipment is placed on the shelf we advise to check, if the strings are secured on the pulleys in the funnels, by removing the caps of the columns (this needs only be done for older platforms, newer ones are constructed in a way, that prevents the strings to fall off the pulleys). After placing the equipment it may happen, that despite previous levelling, the shelf tilts, or even touches the platform (your device can be heavier on one side, or heavier than the maximum load of the platform). In such case you need to tension one or more strings, lifting the device by hand, to minimize the stress on the strings, especially its sheering on the edge of the hole in the plinth, where its guide rail is bent. Attention: in case the device is heavier than the maximum load it should not be placed on the shelf, as it may tear the strings or damage the tensioning mechanism; in such case please contact us immediately. After a few hours of use, the strings may extend if the load is higher than indicated above, and the shelf may touch the base. If this happens, all strings need to be tightened so that the shelf can swing freely (unhindered movement of the shelf above the base is essential for the platform to operate correctly). Usually this lifting and leveling the shelf again is the final one. However with very heavy devices, with a weight close to the maximum load of the platform, it may become necessary to repeat the whole procedure. Please avoid placing more than one unit on a single platform. Otherwise, the platform may become overloaded, which will inhibit its resonance damping properties (partly due to the mutual interaction of vibrations inherent in each of the units). When operated correctly, PAB platforms will last a lifetime. However, since the strings that are a critical component of the product may break, we provide a set of spare strings and PVC tubes with each platform (the tubes protect the holes in the support columns, and are subject to normal wear). place the electronic unit on the shelf. All PAB anti-vibration platforms with string suspended shelves work in the same way, therefore handling is similar in all cases. 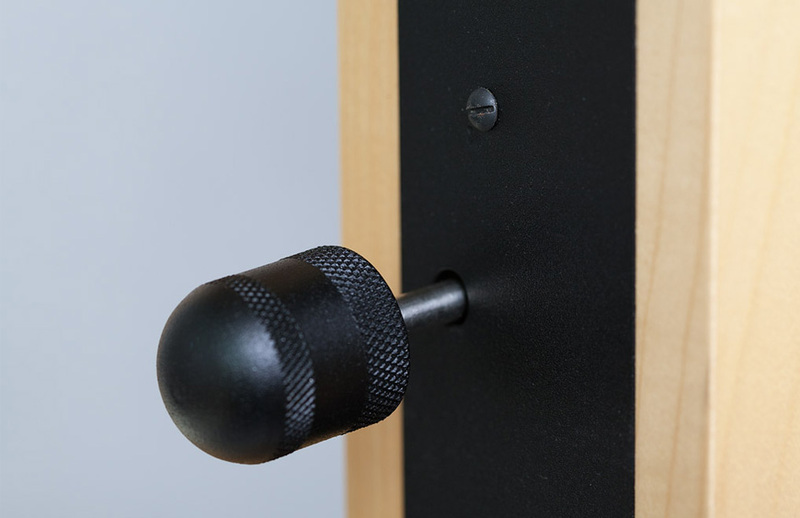 While PAB monitor AVP and PAB reference AVP appear different, they are merely inverted, and have an extra shelf installed on top to cover the support column attachment points that extend upwards and to accommodate monitor speakers of various sizes, while the second kind has an inverted PAB basic AVP inside. If you do not want to repair a platform by yourself, please send it to us. We will repair it free of costs, you will only need to cover transportations fees both ways. levelling of the table top by turning the feet and countering them. 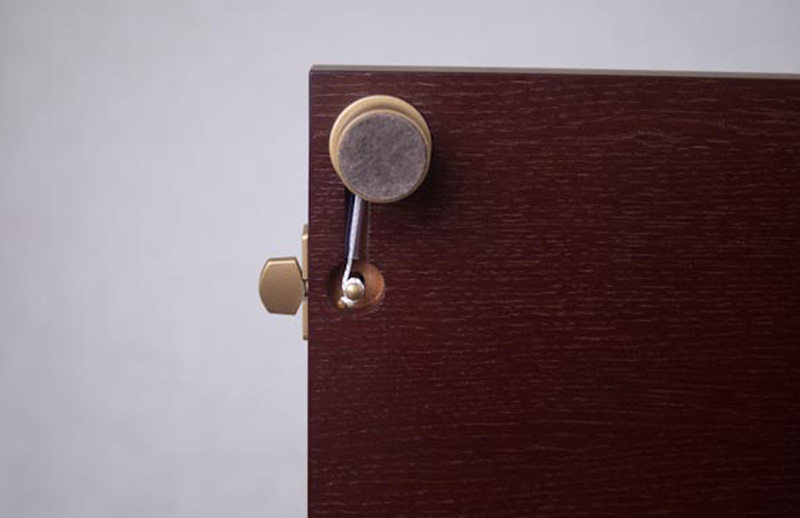 Raising and levelling of the shelves for the electronic equipment using the supplied PAB key, inserted in holes in the metal sheets, which cover the modified tensioners (the strings should be tightened equally, turning the key a few times, so that the shelf is not overly tilted. The shelf should be supported by hand while doing so, to minimize stress on the strings). 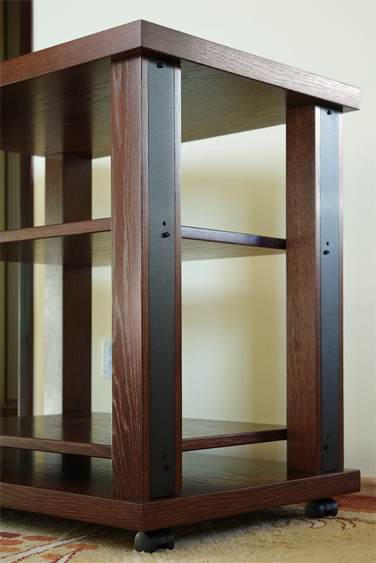 After some time it may happen, that despite previous levelling, the shelves tilt to one side or rest on their bolts (this may happen, when the device is heavier on one side, or its weight is close to the maximum load of the shelf, 42-56 kg). 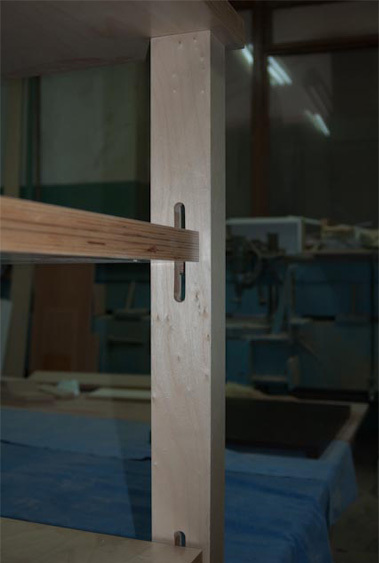 In such case some or all strings need to be tightened again, after supporting the shelf by hand, to minimize the stress on the string, especially where it crosses the edge of the hole in the crossbar, to which the tensioner is mounted (in the newest version of the table this is no longer necessary, as a special transmission mechanism was employed, which eliminates the contact of the string with non-moving surfaces and decreasing its friction). Unhindered movement of the shelves in the PAB table is essential for its function, as it is for all the PAB anti-vibration platforms. 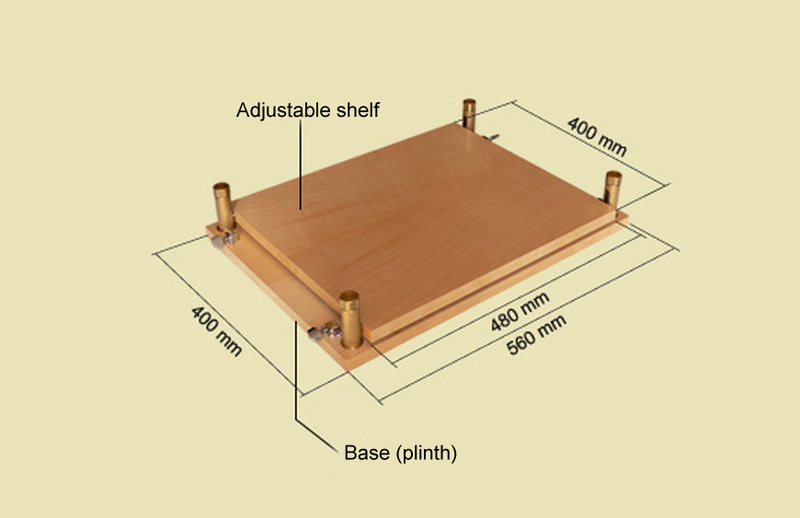 The massive and large table top can be used for placing a turntable or very heavy amplifiers. 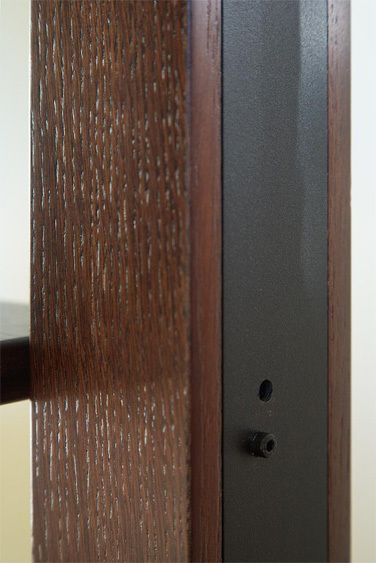 It can stand a load of 160 kg, if appropriate PAB anti-vibration feet are used. When operated correctly, PAB platforms will last a lifetime. However, since the strings that are a critical component of the product may break after big overload of the shelves (for example after violent positioning of the electronic equipment or when somebody supports his or her weight on them), we provide a set of spare strings and PVC tubes with each platform (the tubes protect the holes in the support columns, and are subject to normal wear). Do not remove the bolts from the shelves at no occasion! 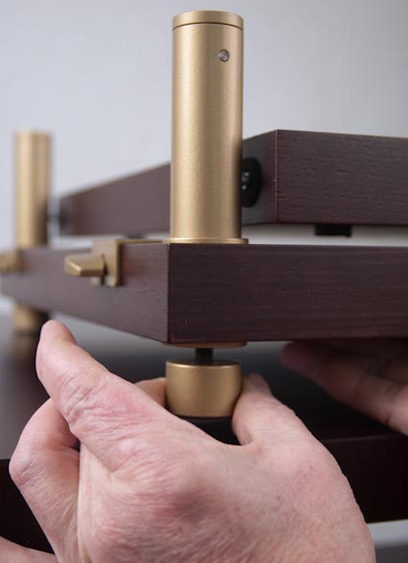 This would result in widening of the openings in the shelves and increase the vibration of the bolts after placing them again, what would greatly diminish the anti-vibration abilities of the table.